Want to know where your customers spend their time so you can maximise your advertising dollars? 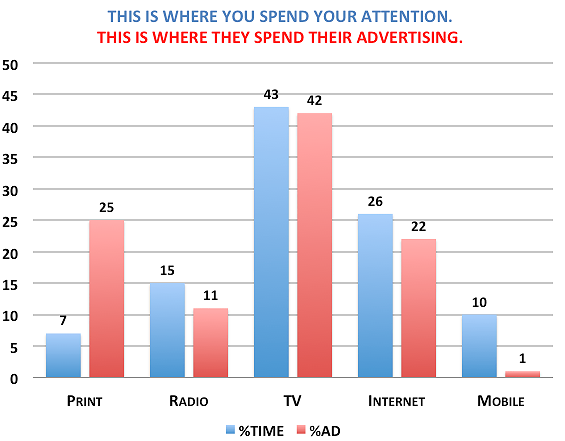 The graph below is a break-down of how much time consumers spend (as a percentage) with each media (BLUE). And the percentage of dollars spent (as a percentage) by business advertisers (RED). Source: Mary Meeker, KPCB (Kleiner Perkins Caufield Byers) 2012. People currently spend more time on their mobile devices than reading print (newspapers, magazines, etc). Mobile will increase further and print will decrease. Businesses are still spending a greater proportion of their money on print advertising even though it commands less attention than mobile use (tablet, smartphone). Big opportunity to capitalise on mobile advertising (i.e. not much competition yet). Main office located in Perth, Balcatta, Western Australia.